Purgatory as a hotel makes sense in The Leftovers because it’s a transient place where souls are coming and departing. Kevin is stuck in a Hilton version of Hotel California without the pink champagne and colitas but where water erases former identities prepping new tabula rasa souls for the next life to come. But it also serves as a recognizable plot device seen in other shows such as the “Sopranos,” “Mad Men,” and “Boardwalk Empire” to name a few, when characters need a reality check usually framed within some sort of alternate sphere. They inhabit another life role as a reflection of their current one. 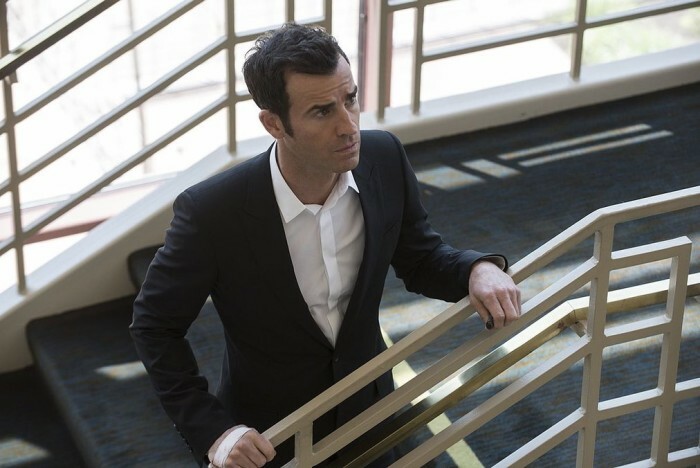 But faith versus empiricism or spirituality versus cognition continue to dual in The Leftovers, setting up Kevin (Justin Theroux) with an introspective nightmare—staged as a spiritual trial or psychological dream? Let’s just call it a perga-dream. But it still sets him up in a world where he still possesses free will. He opens the wardrobe to find Epicetus’—a Greek philospher—quote, “Know first who you are, and then adorn yourself accordingly.” Kevin chooses the black and white suit, which sets him off on an archetypal afterlife plotline like the River Styx in Greek mythology. Patti (Ann Dowd) is given another role as well in the perga-dream, as Kevin discovers when he assassinates her body double, to say that her represented political identity isn’t who she really is. Instead, she’s represented as a child—a wounded child abused by what seems like her father later revealed to be her abusive ex-husband Neil. Fast forward to the ending inside the well, we hear Patti’s regret for not leaving her ex-husband after her Jeopardy earnings. Thinking about this, there’s an association to the quote and Kevin choosing the particular outfit, almost to say that we become who we choose to be, and that wounded child stays with us till the end as if it directs us through our lives—a psychological framework within a spiritual dimension. Perhaps Neil represented a manifestation of Patti’s abusive childhood, which she could never leave, thus sticking with Neil. What also comes to mind again, is Garvey Sr.’s (Scott Glenn) line that he became healed after he listened to the voices. Garvey Sr. appears on what otherwise is terrible cable service to tell Kevin to take Patti to the well. But Kevin goes further, jumps in and listens to what Patti has to say about her life before he ends her, precisely when he wakes up and resurrects. When Kevin encountered the ferryman as he was taking little Patti to the well, or afterlife corridor, Kevin was offered a choice: hang by a rope because what he was doing was abhorrent, or proceed to pass. But the ferryman specifically warned that Kevin would be a different man once he completed the task. Kevin resurrects from the earth in front of Michael (Jovan Adepo) with obvious biblical overtones. Water seems to be a symbol of life and death, not either or but both occurring simultaneously—the prehistoric woman in the first episode dies by the water, but the baby, new life is born; the lake in Miracle, a place without departures but then Evie is taken with the missing water; Kevin finds little Patti drowning in the pool but saves her life; and he consoles Patti before drowning her in the well-water assisting her passing to the afterlife, essentially a new life. But is Kevin truly healed like his father was for listening to the voices? Or is it a death of his conscience? This entry was posted in Frontpage Articles, Reviews, TV Reviews and tagged Ann Dowd, Jovan Adepo, Justin Theroux, Scott Glenn. Bookmark the permalink.